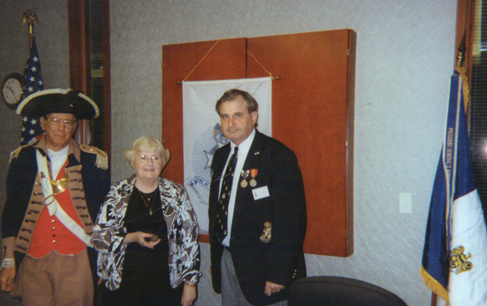 Harry S. Truman Chapter President Dirk Stapleton, the Harry S. Truman Chapter Color Guard, and Mrs. Marilyn Feaster of Lee's Summit, Missouri, are shown here at the June 12th, 2010 meeting. 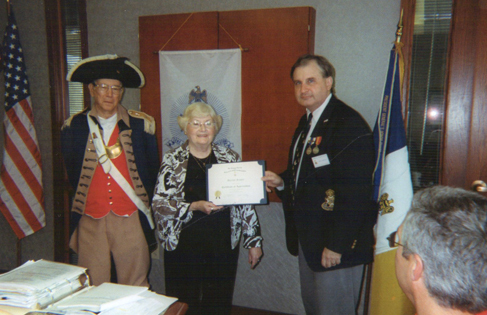 Mrs. Feaster is shown here receiving a Certificate of Appreciation and a Harry S. Truman Chapter coin. The guest speaker was Mrs. Marilyn Feaster, spouse of Compatriot Roger Feaster. Mrs. Feaster is also a member of the Marguerite McNair Chapter in Raytown, MO. Her topic was on Gov. Claiborne Jackson, Missouri governor during the Civil War era. Gov. Claiborne Jackson (April 4, 1806 – December 6, 1862) was a lawyer, soldier, and politician. He was the 15th Governor of Missouri in 1861, then governor-in-exile for the Confederacy during the American Civil War. A Certificate of Appreciation was presented to Mrs. Feaster after her presentation. Photos: (L - R) Major General Robert L. Grover, MOSSAR Color Guard Commander, Mrs. Marilyn Feaster of Lee's Summit, Missouri, and President Dirk A. Stapleton, Harry S. Truman Chapter.